Can you tell how excited we are about our latest formulations of XL EXTRALIGHT® foam injection molding? Foam Creations is closing in fast on our 25th anniversary of surprising customers with closed cell foam products. “It’s quite remarkable our core team has been with us so long. It speaks to the dedication and respect our team has for each other, and our unique manufacturing process,” says Delphine Musellec, Vice President of Operations. Started in 1995, Foam Creations came together quickly with a diverse and determined team and it still remains today, bringing nearly a quarter century experience and design support to our client base in foam injection molding. 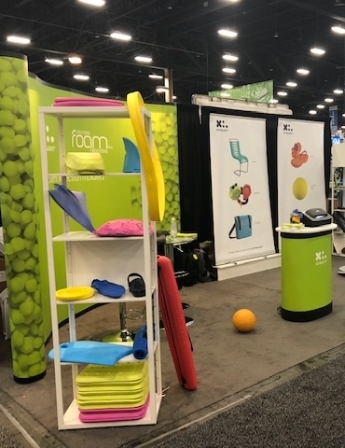 The first dozen years featured foam compound breakthroughs that led to molded EVA foam developments, then production products for Crocs Shoes and the One World Futbol Project (OWFP). Both these startups leaned heavily on the superior properties of our latest XL EXTRALIGHT® polyolefins foam and crosslinked material, which brought new dynamic performance and durability to their markets. For Crocs, the ultralight rebound characteristics of XL EXTRALIGHT® injection foam molding, brought forth a new level of comfort and revitalization in footwear. For OWFP, XL EXTRALIGHT® molded EVA foam made possible for a ball to be virtually indestructible, breathable, waterproof and never need inflation. Both companies took wing with the foundational quality of Foam Creations manufacturing in North America. Our most recent 12 years have given rise to several new developing foam injection molding businesses and has further strengthen our engineering support to customers, through design recommendations, rapid prototyping, quickened tooling lead times and new surface texture technologies. It is quite reaffirming to know that in product development and engineering of injection molded foam products, we have such a foundation of expertise in the injection foam molding process, allowing us younger designers to push the envelope and explore new possibilities for our molded EVA foam customers. Collaboration between client and producer is made confident, when new ideas are encouraged by the senior staff, and fresh concepts are tested against known tolerances of injection molded eva. Advancement in design and rapid prototyping has also quickened the pace of foam injection molding product development and lead time to production. We can now produce soft specification samples in as little as 2 weeks from completed CAD files, helping the customer validate function and fit. Designing in closed-cell injection foam is both an art and a science, and we take pride in both disciplines. Customers come to us with market concepts, and our passion is to help fulfill their mission and dreams. Applying time tested results to new ideas, keeps the work both enjoyable and fascinating. Working with customers in a new industry and with unique needs allows our team to explore new injection foam molding capabilities, and to apply strategies from other foam markets toward new industry. XL EXTRALIGHT® is a superior closed cell foam for medical, home healthcare, high performance, and recreational seat support. The low specific gravity and high strength-to-weight coefficient is unsurpassed in the molded EVA foam industry. A myriad of densities and durometers are available from Foam Creations, allowing each customer to find the best performance possible. Foam Creations welcomes foam injection molding projects now for the 2020 product season, in which it will be celebrations its 25th year of satisfying customers with breakthrough injection closed cell foam products. Each project coming to us, or ones we think of and find homes for, bring a special satisfaction knowing that its industry will be benefiting, and people are served. Not just “light” its XL EXTRALIGHT®!